Tonight I decided I needed some inspiration, needed to stamp and be creative, but it's always easier with a challenge. So, I picked the Paper Players Color challenge. Look at this to die for picture-doesn't it make you NEED dessert! And actually, I already had a very wonderful chocolate dessert for lunch, but this one still looks good. I looked around my room to see what might work, and settled again on the French Foliage set. I've always been a fan of leaf sets, but this one in particular really appeals to me. Maybe I'm just tired of nearly 100 degree humid days and READY for fall!!! 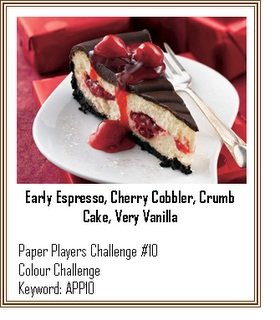 Card base is Early Espresso with a layer of Cherry Cobbler behind a Very Vanilla background. On that background, I centered an Oval Scallop die frame and sponged Crumb Cake onto the Very Vanilla. In the center of the oval I stamped the saying from Word Play in Early Espresso. Then I stamped the large leaf in Early Espresso at each corner and filled in with a smaller one in Cherry Cobbler. The corners on the Very Vanilla and Cherry Cobbler layers are rounded with the Corner Rounder. The edge of the Very Vanilla is sponged with Early Espresso. Next, I took my Crop-a-dile and punched a slot on each end of the oval long enough to insert the wide Early Espresso striped grosgrain through. Not completely as wide as the ribbon, it is gathered just a bit. I went all the way under the Very Vanilla layer and knotted the ribbon on the left side. The Cherry Cobbler button has both Very Vanilla and Early Espresso grosgrain knotted through it. It is attached with glue dots just over the punched slot on the right side. Bet you can't wait for your Holiday Mini to arrive in your mail box, and for the sales period to start. September 1st!! Not that I ever like to rush the calender, it goes pretty fast on its own!! Love this pretty card with the sponged oval centre...this new set is awesome!! Thanks for playing along this week! Great to see you back at the Paper Players! Just gorgeous! What a great use of these lovely leafy images. I am so glad you played with my colors this week! LOVE your card, and LOVE the colors! You may have enabled me to have to have that leaf set!~!as if I don't have enough leaf sets already!!! I do love what you did with it! Wow, I looked right past that set in the mini. I may have to rethink that. Beautiful card. Love how you used your stamps. LOVE this card. I got this set and know that I am going to really enjoy using it. I love the fact that you incorporated the colors using this set. 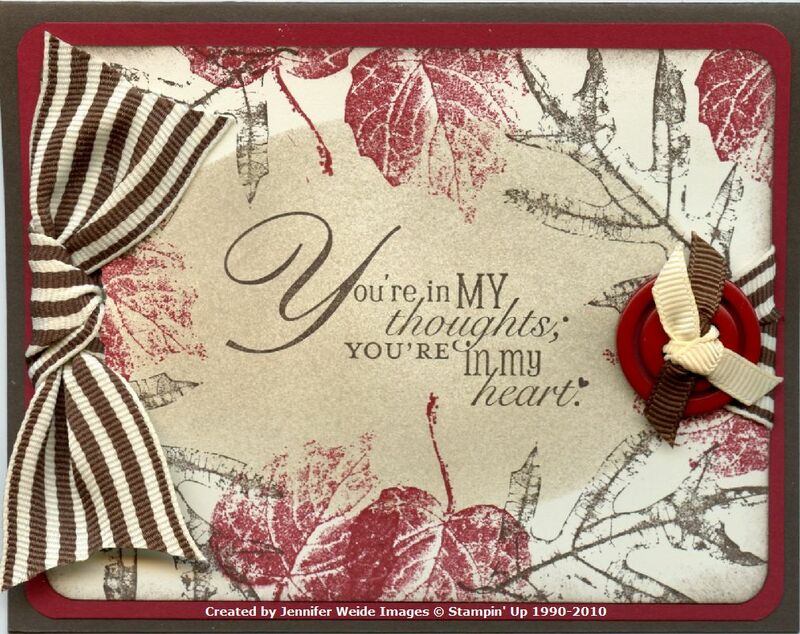 the button and the ribbon are the perfect touches for this gorgeous card. thank you for joining the Paper Players again this week. 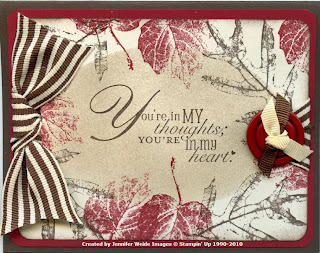 Love how you surrounded the sentiment with the leaves..beautifully done! Stunning! I love these leaves! Such a serene card! Thanks for playing with the Paper Players!